I entered this competition on the off-chance hope of having George Saunders read my work–as a lark, in other words. The good news was just announced–I won for fiction, and Michael Prior won for poetry. Congrats, Michael. I’m grateful to Lit Pop and the judges, and most of all, to George Saunders for his generosity in choosing my piece “Battery,” a hybrid fiction/cnf work, and for his great comments. The piece is a story about a newborn chick in a factory farm as it has its beak docked. 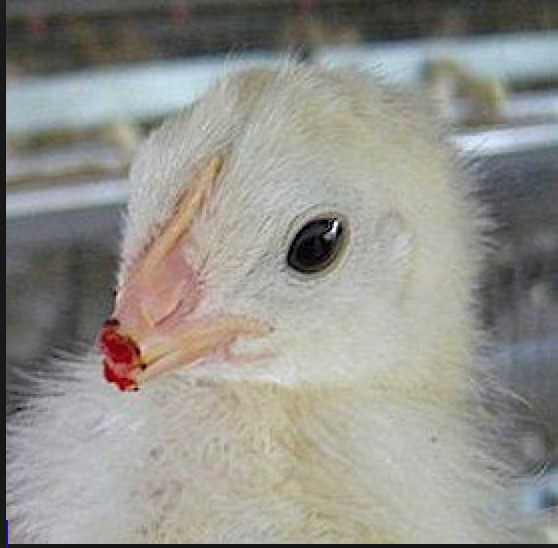 It is routine for chicks to have one-third of their beaks amputated without anesthetic. It would be stellar if this piece could play some small part in erradicating the torture-chambers that are factory farms. George Saunders’ most recent book, Tenth of December (stories), was published in 2014, was a National Book Award finalist, and was named one of the best books of the year by People, The New York Times Magazine, NPR, Entertainment Weekly, New York, The Telegraph, BuzzFeed, Kirkus Reviews, BookPage, and Shelf Awareness. He is also the author of Pastoralia and CivilWarLand in Bad Decline, both New York Times Notable Books, and The Very Persistent Gappers of Frip, a New York Times children’s bestseller. In 2000, The New Yorker named him one of the “Best Writers Under 40.” He writes regularly for The New Yorker and Harper’s, as well as Esquire, GQ, and The New York Times Magazine. He won a National Magazine Award for Fiction in 2004 and his work is included in Best American Short Stories 2005. He teaches at Syracuse University. Congratulations–once again, Jane! I love this story for all of the same reasons Saunders does, but also for your bringing to light in such a palpable way the horror of how we treat the animals we use for food and the way such treatment parallels our abuse of each other in a capitalist economy that encourages us all to avert our eyes from both.